My book is finally out in the wild! When I started writing I set a goal of being published before I was 35. My birthday is next Saturday and, you guessed it, I will be turning 35. I managed to hit the goal I set for myself exactly one week before my deadline. Sure, I technically signed the contract over a year ago, but I didn’t really consider myself published until my copy arrived from Amazon. It is quite a feeling seeing your name on the cover of a book for the first time. 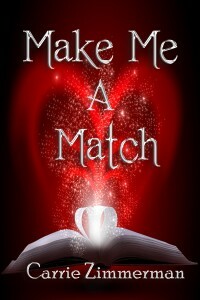 Since I wrote MAKE ME A MATCH, I have finished two more books which are in the process of being submitted and I’m almost finished with a third. I’m sure as time goes on and I have more books that find their way out into the wild I will get used to others reading my work, but I hope the feeling I felt when I opened that box from Amazon and saw my name on a book cover never goes away.